As the year slowly draws to an end, and colder weather sends us indoors during the darkness of Winter, getting outside to get any birding in sometimes has to wait till the weekend. However to satisfy my thirst for bird activity, myself and thousands of others across this country get our bird feeders prepped and ready for our birding fix. Now my feeders have been up for over a month (I normally don’t feed the birds during the warmer months, except Hummingbirds) and I’ve added 2 new birds to the yard list, and I just love watching as they feed. But sometimes I get bored with feeding the birds the same old stuff. So I start to experiment, and look for different recipes for my little friends. 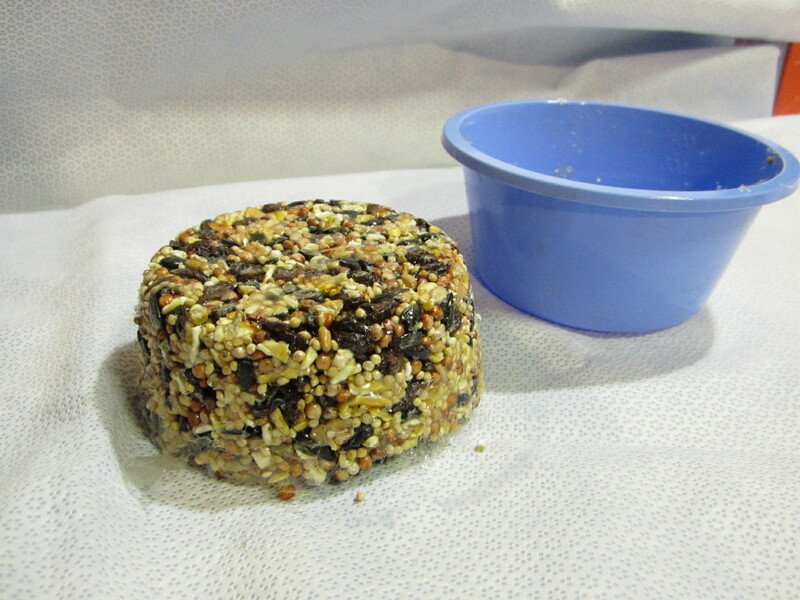 And being someone who is always up for a challenge, I set upon myself the task of finding a good recipe for a bird seed block. So you may ask yourself, why would you go to such trouble in making them when you can find them on-line, or at your local store that may specialize is items such as this? They can be pretty pricey for starters. One of my favorites web sites where I have gotten plenty of inspiration over the years is Duncraft. And if you visit their expansive site, and locate the page where they display their seed blocks you to will see what I mean. Click “HERE” to take you to the seed block page. Now don’t take this the wrong way, I love Duncraft, really I do. My next suet feeder I’m buying will come from them, just not their seed blocks. So without further ado I’m going to lead you into my secret laboratory, and share with you a super simple recipe for seed blocks. 2- 1/2 oz. unflavored gelatin packets. 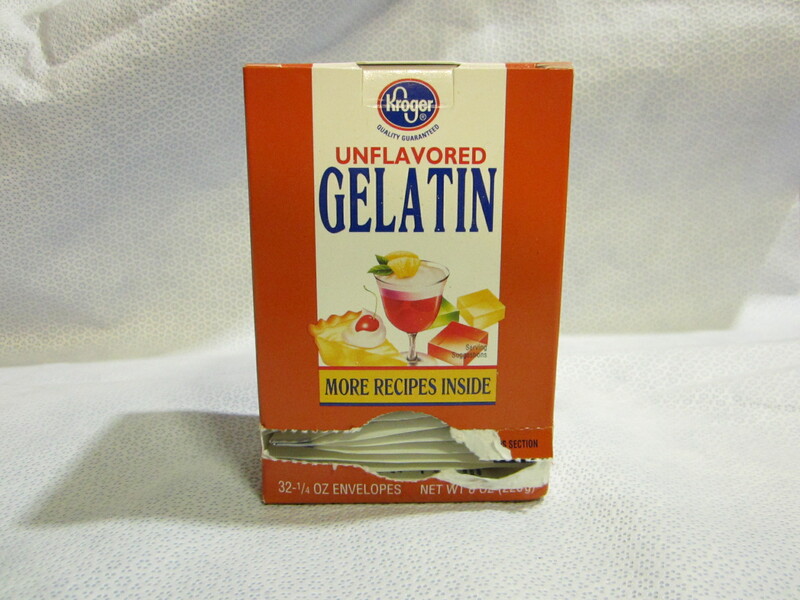 Now I use Kroger brand gelatin that comes in this handy box, however the packet size is 1/4 oz. each. So you’ll need 4 of these packets for the recipe. 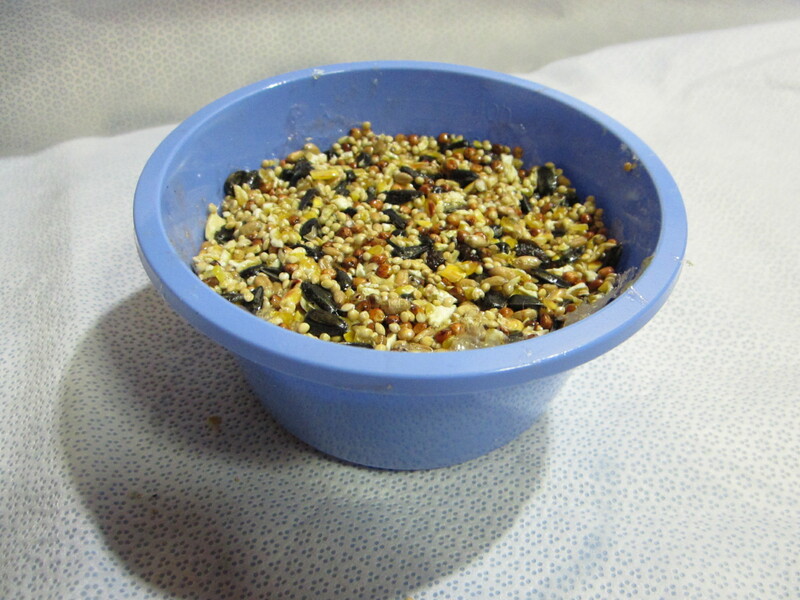 The mix I used for this recipe has in it some cracked corn, Sunflower seeds, Millet, Milo seed and some other stuff I’m not too sure of. Dissolve the gelatin in the water over low heat till water becomes clear. This won’t take long. HINT: I use a old pot that we used for camping that has a non-stick surface. Helps with the clean up. It gets real sticky. 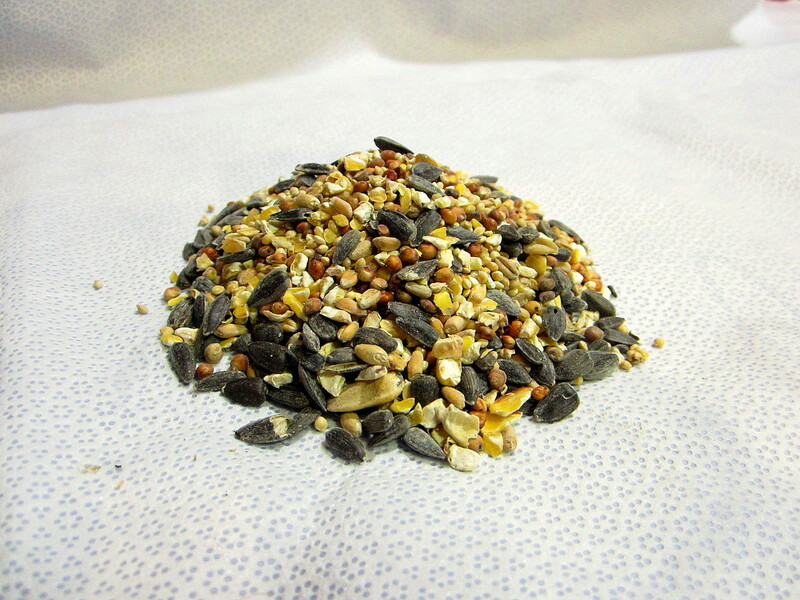 Mix the seed into the gelatin mixture and coat the seeds thoroughly. Then pack the mixture, pressing firmly, into whatever container you wish to use. I coated one of my hands (the one that was packing the seeds into the container) with some cooking oil so the seeds wouldn’t stick to my hand. This stuff is real sticky! To clean the pot I soaked it in hot tap water for several minutes till the remainder of the gelatin dissolved and seeds loosened up. Then washed it with dish soap afterwards. I used this 16 oz. plastic bowl that we dispose of at the place where I work. Then put your creation into the chill chest for several hours to set the mixture. And since the bowl I used was plastic I was able to squeeze on the sides and bottom of the bowl till it came out. The beauty of this recipe is that you can double it, and shape it into any configuration you like. And you don’t have to stop at just using seeds. This block that I made for this blog post had some stale raisins in it. 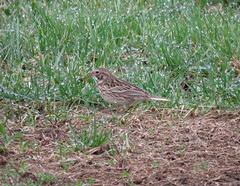 They were a little hard for human consumption, however the birds will love it. Remember that gelatin is one of the main ingredients, and if it does get wet due to rain, that could dissolve the gelatin and the block will become mushy. A covered platform feeder works well, or wait till it gets real cold and the threat of rain is behind us. Whatever you do have fun with this recipe, and try some experimenting. And if you come up with a neat idea that can improve on this, let me know. Remember I’m always up for a challenge. That sounds like a fantastic recipe. I’m just wondering, though, if the gelatin is okay for birds to eat. Is it normally found in commercial products? 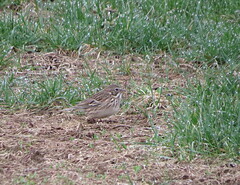 By the way, I leave my feeders up in the summer. 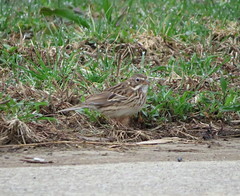 I adore watching the adult Chipping Sparrows bringing their babies to my yard! Is the gelatin safe for domestic pet? I feed my tiels and parrotlet all organic and I would like to make them blocks that swing (which they love). I was just reviewing this and was wondering if the math was off. Four 1/4 oz packets would make one oz, wouldn’t it? Should it be 10 1/4 oz packets to make 2.5 oz? Or does the recipe call for 1 oz? Kacie, you know you might be correct, It’s been a long time since I posted that story. When it comes to seed blocks it was always a trail and error process. I know I have it written down somewhere, I just can’t find it. I have another recipe that calls for honey and egg whites I’ve yet to try. So you see there’s always something different out there. The internet was a big help but not everything worked well for me. When I worked with the gelatin I did notice that it did break down when it got wet, so I made sure it was under some sort of covered feeder. Hi can I use that Gelatin Photo in a video of mine on youtube? Hi, can I use this Gelatin Photo in a youtube video of mine? So you can, that be great. When you get the video uploaded to Youtube send me the URL. I’d love to watch it. https://youtu.be/i5ZShFr0jOI Thanks again! Your info is listed in the pastebin file under the description for attribution. I like to feed the love birds, that are now part of the Phoenix, AZ landscape (unfortunate since it’s because of their being captured and then escaping here), and they hang out eating sunflower seeds, and such. I recently bought a clearanced bird block, and they are loving it, but it’s disappearing, oops I mean it has disappeared, and they are not happy with me. These are quite pricey, as Les said, so of course, I’d love to make one. My concern is…since it’s so hot here (115, at times), will the gelatin hold up to the heat, if it’s not out in the sun? Saundra, as hot as it gets in Arizona I wouldn’t be surprised that suet, whether it’s made from gelatin or whatever will become soft if not melt in the type of heat you experience. Myself personally, I don’t put any kind of suet out during the warmer months. I use it during our colder months when the birds really need it. What you might try is buy just one cake of your run of the mill store bought type and hang it outside, preferably in the shade, and see what happens. Thanks for the replay Les. I actually did make a cake out of just peanut butter, lard, and seeds, yesterday, but the love birds evidently don’t care for it, since they are ignoring it. ;( So, I guess it’s off to the store. Btw, it is in the shade, and didn’t completely melt. And just maybe they don’t care for the peanut butter. I only added that because someone else said they had. Thank you. My seed molded. Is there a way to get around storing the blocks so they don’t grow mold? I would try to wrap them individually in plastic wrap, stick them in a freezer bag and put them in my freezer. I store mine in a styrofoam cooler.